Most people do not know anything about computer security, yet they browse the Internet everyday. Using an unsecured computer on the Internet in 2005 is exactly like walking alone through a dark alley in the middle of the night with 5000$ in your wallet: It’s risky. It only takes around 15 minutes for an unsecured, unpatched computer, to get infected by a virus after being connected to the internet. How do I know? I tested it myself on several occasions. I installed windows XP on a brand new machine, added an anti-virus application on it, and plugged it directly on a broadband connection. Each time I did this, it only took between 5 to 15 minutes to have a virus try to get in my computer through an unpatched windows vulnerability. In addition to this, you also have to be protected against human intruders that may want to take possession of some of your personal information to commit various crimes (credit card fraud, Identity theft, etc...). With this article, I'm trying to point my inexperienced readers to the best tips and resources on the Internet to secure their digital lives. Here are a few easy steps to help you secure your computer. There are a few good ones out there. Some are free, but most are not. Avast! antivirus: Another free antivirus, usually has better removal success than AVG. First of all, what is a firewall? A firewall is a piece of software or hardware that helps you secure your computer by putting a very strong gate in front of it. This gate has a lock to let certain people in, but most cannot, exactly like the door to your home. The technical description would be: A piece of software or hardware used to prevent unauthorized access from a computer system or network of computer systems. If you are using Windows XP, let me tell you the good news: you do not need any additional software or hardware to be protected. Windows XP already has a built-in firewall, so all you have to do is activate it. Follow this tutorial on Microsoft’s website to learn about how to do it. If you are running any other operating system, you will need to buy a software or hardware firewall. I would recommend you to buy a hardware firewall like the WRT54G. This little device protects you from outsiders in addition to let you share your internet access with up to 3 other computers. If you want a free solution, you could always use ZoneAlarm from Zonelabs. ZoneAlarm is free for individuals, so you do not have to break your budget to be secure. Each second Tuesday of each month, Microsoft releases some new patches for all of their products affected by security or reliability problems. System administrators through the world ironically named this day "Microsoft’s black Tuesday". Why should you patch your computer? If there would be no lock on your front door, would you go and buy one real quickly? I bet that you would. Each month, malicious hackers find ways to get into Windows by finding flaws affecting assorted areas of your operating system. If you do no fix those flaws, some hackers could get in your system using these security holes. Even viruses can use these holes to try and get into your computer. Having an anti-virus doesn’t necessarily means that you are protected against all threats! Sometimes, a virus can move around quite a bit before security companies get the anti-virus definition out to their customers. There are several ways to help you patch your computer quickly and effectively each month: Windows Update and Automatic Update. Windows Update requires some human interaction, so it is not as good as Automatic Update. If you think that you will forget to go and visit their website each month, you really should be using Automatic Update instead. However, Windows Update offers you some additional, non-critial patches to some software that Automatic Update do not support. They also offer new versions of some of their applications (ex: Windows media player) and device drivers. This means that even if you are using Automatic Update, you should also visit Windows Update once in a while. 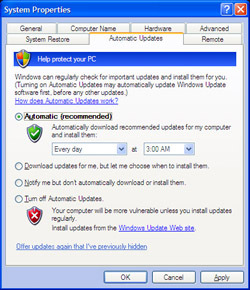 Automatic Update updates your computer automatically as soon as you are connected to the internet. First, it verifies what patches are missing from your system and downloads them after. It’s as simple as that. You do not even have to think about installing them each month! Everything is automatic. To enable Automatic Update on windows XP you need to go to “Start” -> “Control Panel” and double click on the icon called “System”. This will open a "system property" window. Click on the “Automatic Updates” tab and check the “Keep my computer up to date” box. After, select the “Automatically download the updates” button and schedule them to happen at a time of your choosing. Do not forget that your computer needs to connected to the internet for these updates to happen. In Windows 2000 (sp4) go to “Start” -> “Control Panel” then find an icon named “Automatic Updates”. Double click it and follow the process described for windows xp in the paragraph above. Warning: Unfortunatly, these patches can break your operating system sometimes and there is nothing you can do about it. Please be sure that System Restore is enabled before proceeding. If something stops working after, restore your system to a previous state. Switch to Firefox! Download it here. What the heck are spywares? Spywares are software that secretly gathers some of your personal browsing information through your internet connection without your knowledge. Companies that manufacture spywares usually do this for advertising purposes. Most of the time, these application are hidden into freewares or sharewares. Nothing is ever free on the Internet, always remember that. Spywares are not considered as viruses, so most anti-virus applications will not detect them. Here are a few free applications that you can run to help yourself get rid of those pests. I would recommend that you run at least 2 of these products each week. 1 isn't enough to remove all spywares from your system. 6- Think twice before you do anything. Maybe twice isn't even enough. Always use your head before doing anything! Umm..? FireFox isn't all that great - I'd go with Opera..
Wow! Cool! I've bookmarked you!